Are you getting hit with this Arctic blast? 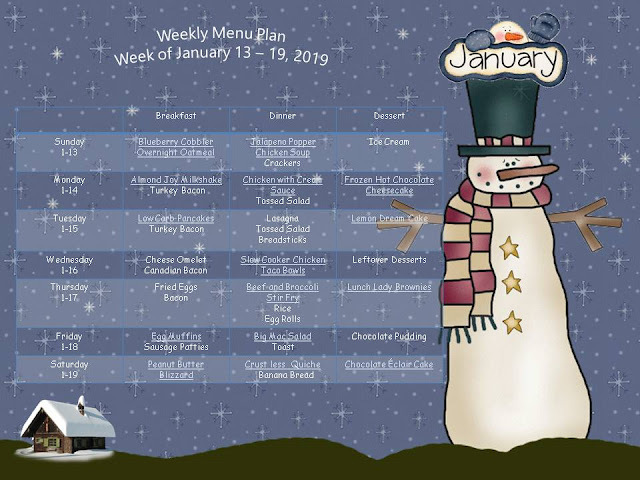 We are heading into a super cold week here. I think the high temperature for Wednesday is 1 degree. You can bet I will be in front of the fireplace with a hot cup of coffee and a blanket! How many days until spring?? 52? It's definitely time to start thinking spring! At least we'll be heading into February at the end of this week! Gluten Free Homemade Chicken Nuggets are from Mama Knows Gluten Free - so good and not hard to make at all! New York Cheesecake is from Food For A Hungry Soul - I haven't tried this recipe yet, but it sounds perfect! Chopped Salad is from Nutritious Eats - I don't know what it is about a chopped salad, but I love them! It is my favorite thing to get at Subway and Portillos. So good! Roast Beef is from Frugal Momeh! Turkey Manhattans - For these I use Carving Board Turkey (Oscar Meyer), and gluten free turkey gravy mix. Just heat the turkey and the gravy on the stove top, and serve it over white bread or toast, along with the mashed potatoes and gravy. Just an open-faced sandwich! Quick and easy! Almond Maraschino Cherry Cupcakes are from Your Cup of Cake - so cute and delicious! That takes us through January and into February! I think we can do this!! 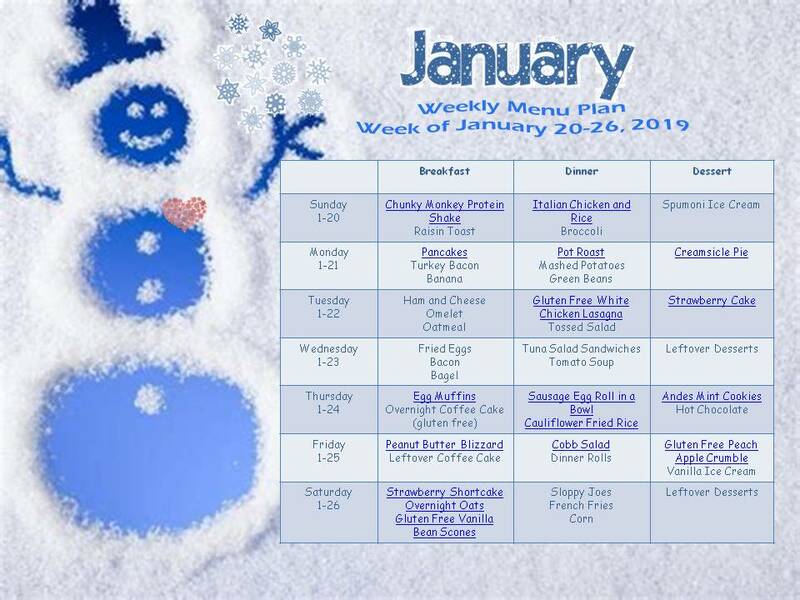 Have a wonderful week, and I hope you find a delicious meal plan or recipe while you're here! 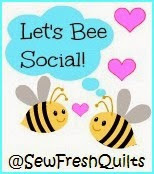 Don't forget to follow me on Pinterest if you like cooking, baking, sewing, or knitting! Just click on the button at the top of the sidebar! Stay warm and happy cooking! Last night, as it was snowing and the wind was really blowing outside, I knew it was going to be a cold Sunday morning. Right before I went to bed, I decided to make an overnight coffee cake gluten free. I usually don't have much luck converting recipes, but this time it worked! I have had this recipe for years, and used to make it for my kids on the weekends Many moons ago, that is! But I haven't made it in years. So I went to the kitchen, threw it all together in about 15 minutes, and put it in the fridge overnight. This morning, I took it out and let it sit for about 30 minutes before I turned on the oven to bake it. When I pulled it out 40 minutes later, the kitchen smelled wonderful! 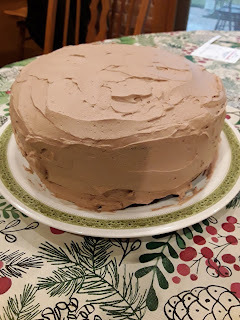 And the cake looked pretty good, too! I threw together a powdered sugar glaze with some cinnamon mixed in, poured it over the top, and let it sit for about an hour before I cut into it. 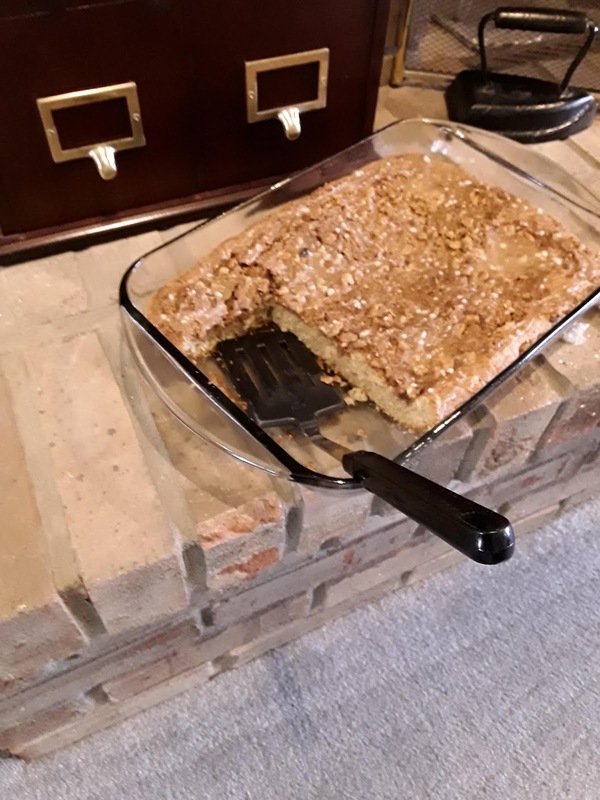 We had some coffee and a piece of coffee cake in the living room, curled up on the couch watching Sunday morning shows. It was delish! I baked it on the lowest rack of my oven to see if that helped with the gummy bottoms I sometimes get with gluten free baked goods. Success! It was done perfectly, and had a nice, moist crumb with a crunchy sweet topping from the pecans and brown sugar. A perfect treat with a cup of coffee or tea! To make it the traditional way (with gluten), just change the flour to 2 cups of regular all-purpose flour, and use only 2 eggs instead of 3. And I would bake it on the middle rack, not on the bottom! If you try it, I hope you like it! 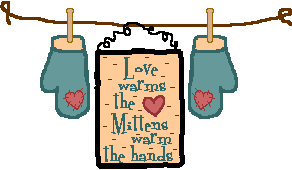 Have a great Sunday, and keep warm! 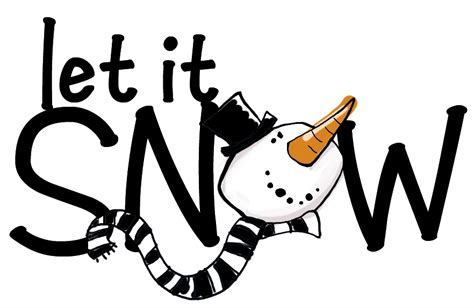 Are you getting any snow today? So far we have just had rain, but any minute now it is supposed to turn to snow. And ice. We shall see! We are supposed to go to one of the grandkid's recitals later this afternoon, but we are still deciding whether to venture out. I really do not like driving on ice! This week I am including more gluten free meals - for 2 reasons. First, my husband seems to be eating my gluten free foods without complaining and actually seems to like some of them. Second, this way I get to eat what everyone else is eating and I don't have to make something different just for me. Some days it's hard to throw something together for just me after I've cooked and baked all day for everyone else! Not a very healthy plan for me, either! I end up eating way too many carbs because I grab what is quick and easy. I'm trying to improve on that. Chunky Monkey Protein Shake is from Dashing Dish - we are loving these for breakfast! Pancakes are from Mama Knows Gluten Free - my go to site for the best gluten free recipes! Her recipes are perfect for families with some gluten free eaters, and some not - because everyone likes them! Plus they are easy to make (as well as yummy) - a win-win for me! Pot Roast is from The Coers Family - this is a new way for me to make gravy, can't wait to try it! Creamsicle Pie is from Serious Eats - trying to get a little taste of sunshine into our menu! Gluten Free White Chicken Lasagna is from Tastes of Lizzy T - another new recipe for me to try, but I found the gluten free lasagna noodles at Meijer and cannot wait to try this one! Strawberry Cake - another attempt to bring a taste of spring into January! Egg Muffins are from Three Many Cooks - we really like these! They reheat well, too! Sausage Egg Roll In A Bowl is from Buns In My Oven - So good! But I only use 1 teaspoon of sesame oil because it is kind of strong, and we like just a hint of it. Cauliflower Fried Rice is from That Low Carb Life - I have never tried this before, and I am making it without the chicken so it is just a side dish to the Egg Roll In A Bowl. Andes Mint Cookies are from Gal On A Mission - these look so good! None for me, but I'm sure my taste testers will gobble them up! Peanut Butter Blizzard is from The Well Planned Kitchen - LOVE THIS! Cobb Salad is from All Recipes - this recipe is easy to tailor to what you like in a salad. I will use Thousand Island Dressing on ours. Strawberry Shortcake Overnight Oats is from My Fussy Eater - this sounds wonderful! Gluten Free Vanilla Bean Scones are from Gluten Free On A Shoestring - a great gluten free baking site! Whew! That was a LOT of links! I can see I have some kitchen time this week! I hope you all can find an idea or two to use with your families! 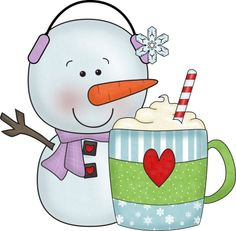 Have a great week and stay warm! 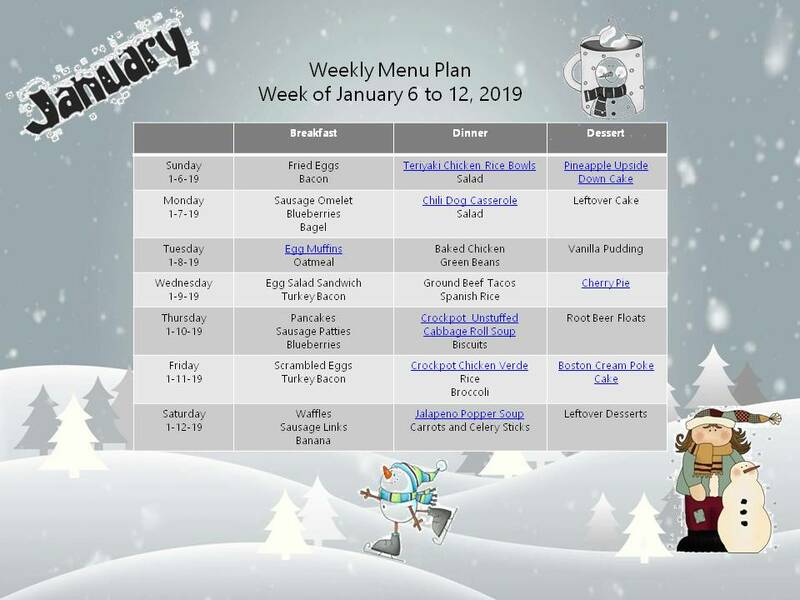 It's time for another week of menus! 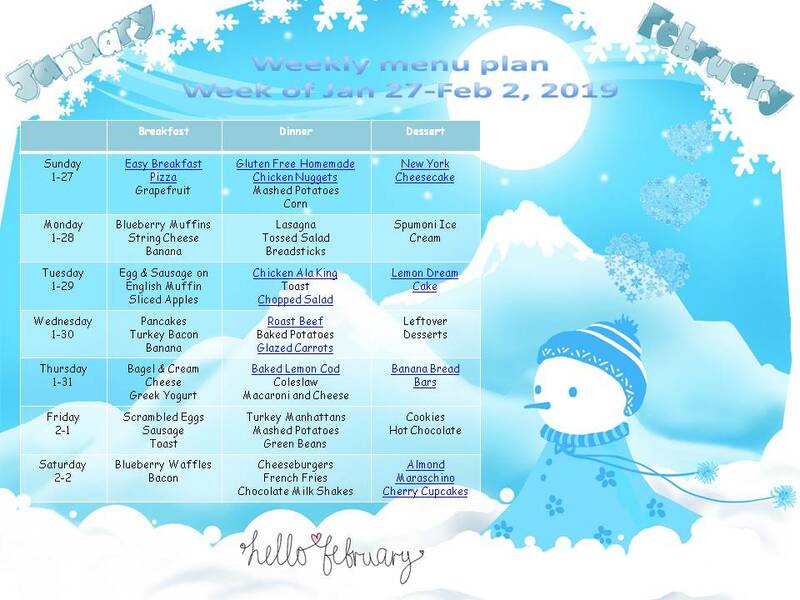 We are still trying to eat a bit lighter, and are enjoying a lot of the new recipes! We are almost halfway through January already! We got a good snowfall today, about 6 inches, and that is the first major snow we have had all winter. It was perfect snow for making a snowman, perfect weather (around 30 degrees), no wind, and the snow just fell gently all day. I saw A LOT of kids out playing in the snow, reminded me of when I was a little girl in Chicago. One winter it snowed and drifted so bad we couldn't open the door to get outside! Thankfully, we don't usually get that much snow here in Indiana. Lots of new recipes for me this week. 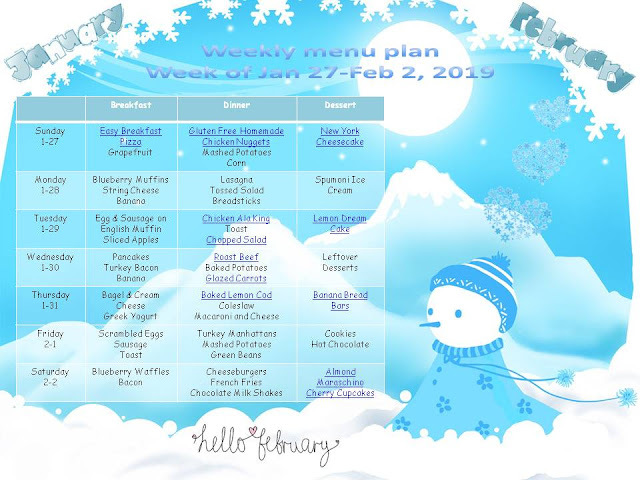 Last week we enjoyed almost all of them! I'm hoping our lucky streak continues! We are especially loving the protein shakes in the morning! Big Mac Salad is from Wholesome Yum - we have made this before and it is delicious! Crustless Quiche is from Mrs. Criddle's Kitchen - another one that is gluten free! So here I am at the beginning of a new year, again, sitting with piles of unfinished sewing projects from last year. I mean well. I really do. But things get in the way, you know? If all I had to do was sit and sew and quilt all day, I …..oh, let's be honest. Even if all I had to do was sew and quilt all day, I'd still have piles of unfinished stuff I just didn't get around to finishing. 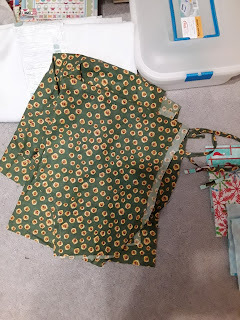 This year, I am making a dedicated effort to finish those projects and use up a bunch of my fabric. So I can go buy some more fabric! 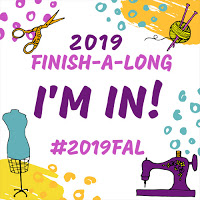 There are so many new fabrics I want to buy, but I am having a hard time justifying it when I have a sewing room piled with fabric and stuff I haven't made yet. And books. And patterns. 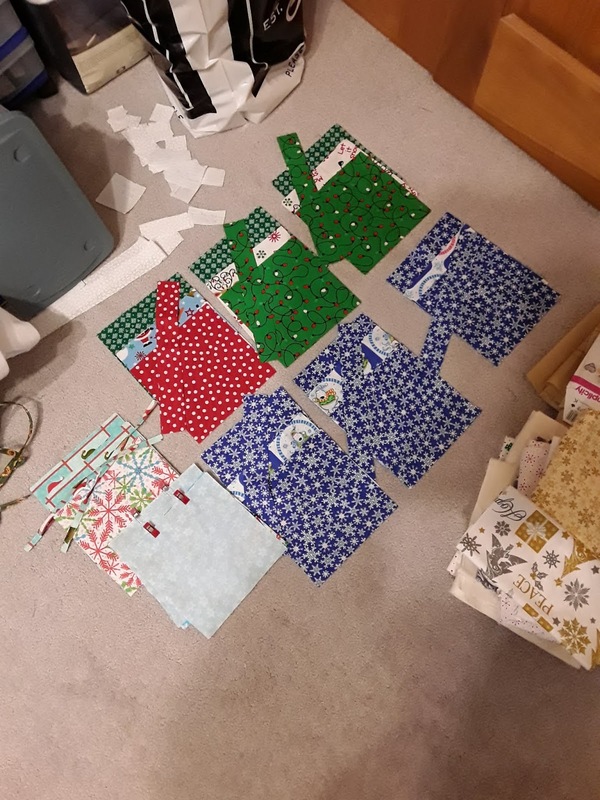 And fat quarters are all over the place - on my table, on my ironing board, on the shelves, on the floor! I think they multiply like rabbits! Yet, when I go to make a bag or piece a new block, I never have what I want. So I go buy more. I need to be a better planner. I start so many new projects, spontaneously. I see something on Instagram, or Pinterest, or Facebook, and I immediately have to make one. Quick - push aside what I am working on. Start a new project. I can do 2 things at once, right? Or 3? Or maybe I can knit in my spare time in the morning, cross stitch in the afternoon, and sew after dinner until bedtime. I guess I forget that it takes me at least an hour to figure out where I left off, and what comes next, and by that time I'm ready to call it quits for the day. 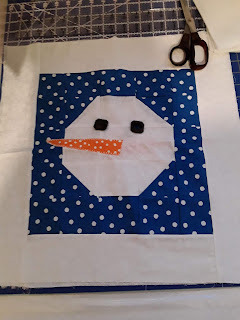 I have two of these snowman blocks (the second one is hidden underneath. They are HUGE. I have no idea why I made them, but I didn't do a good job on them and they are so old I can't remember when I made them. It may have been in a previous life. Did I mention they are HUGE? The blocks are about 17 X 17 each. Why did I keep them? Why did I make them? Who knows? But they have been on the bottom of a pile on my ironing board and I am sick of them. 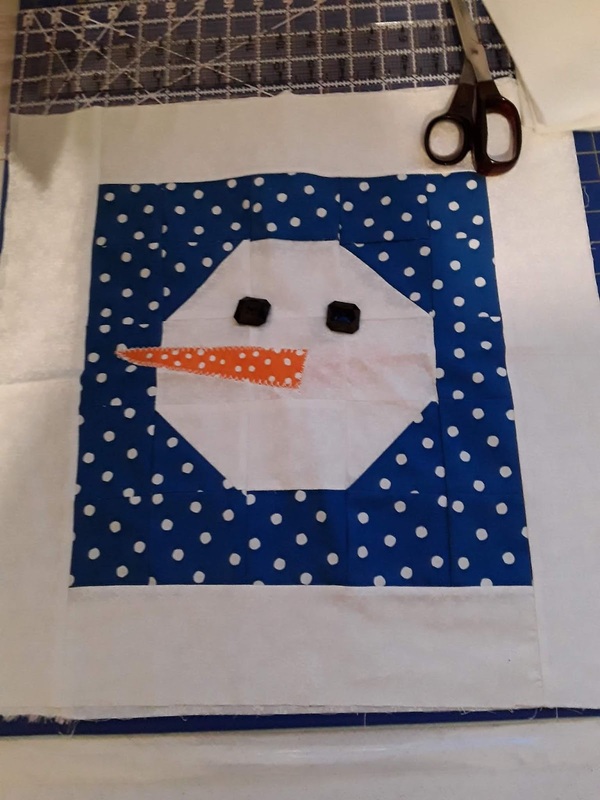 So, I am going to make them into a GIGANTIC SNOWMAN TOTE bag. I want to cut a lining for them, make some handles, sew it together, and use it to carry my knitting in. These are going to be small bags.There are 8 of them cut out and ready to sew together. I just have to fuse some batting onto them and sew them together. I was supposed to give them as gifts to the kids at my granddaughter's bus stop at Christmas. That didn't happen. Maybe Christmas 2019? I did finish a couple of them I used as gifts for kids, and I have one finished. Eight more to go, and I will be all set to fill them with goodies! And this is a cut out, half sewn, Dottie Angel apron I wanted to make in the fall. The ties are sticking out from underneath, but that is where I stopped. I have to make darts, attach the ties, and finish sewing it up. Anybody want to join in on the fun? 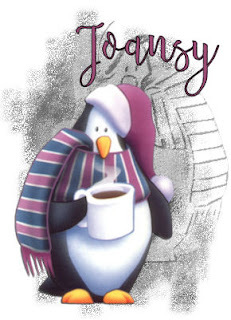 It seems like I should be sipping hot cocoa, looking out the window at piles of snow. It is January, right? Instead, we took a lovely walk today in the sunshine, birds were singing, and I actually see the tips of my daffodils just peeking out of the dirt. It felt like a beautiful spring day! I don't know about you, but I'll take it! If this is the coldest month of the year, I can handle it! Every day we get above freezing is a good day for me. And so far so good! The holidays are officially over, and this coming week is the first week in a long time that I don't feel rushed to get things done. It's kind of nice, isn't it? After a few days of unwinding after the holidays, it feels good to get back into a routine and just calm down. We are feeling the after-effects of too many goodies and rich foods over the holidays. It is such fun to sample everything, but after a bit we start feeling bogged down and just plain heavy. So this week I am trying to lighten things up a bit so our old tummies get a bit of a break. You know what they say about too much of a good thing! I think we're there. And that's a wrap for this week! I sure hope you find a menu or recipe you like! 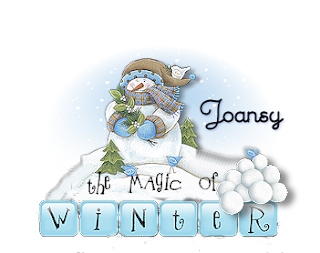 Have a wonderful week, and keep warm! Here we are in a new year! 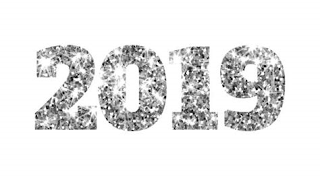 I can't wait to see what is in store for the new year! Although I am looking forward to the new year, I am not much of a party girl. We don't usually go out to celebrate on New Year's Eve, and just like to cocoon and enjoy the end of the holiday season at home. But last night, my daughter invited us over to play games with the family and have a nice warm bowl of chili. 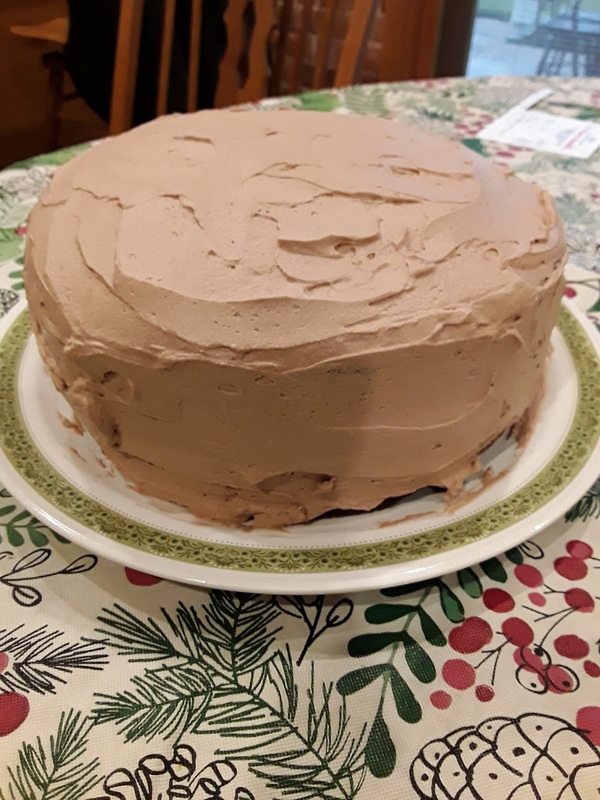 I had made this hot chocolate cake in the morning, just to try a new recipe, so I took it over to her house. Definitely a keeper! I combined several different recipes into this one, and apparently it worked. 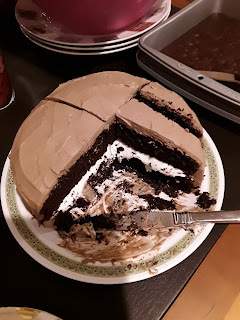 I couldn't taste it because it's definitely not gluten free, but everyone else loved it! And there was a line to grab more pieces, so I jumped the line to grab a quick photo. The only small part left at the end of the night was claimed by my youngest granddaughter, so I left it there for her to have today. 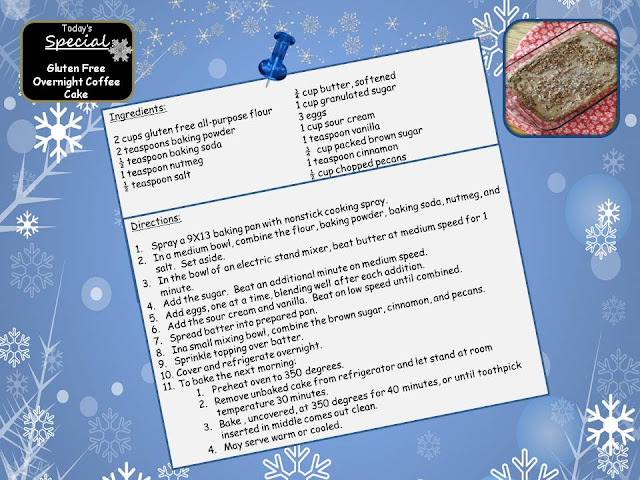 Don't let the length of the recipe scare you, it is really easy to put together. And the whipped cream frosting is SO GOOD! 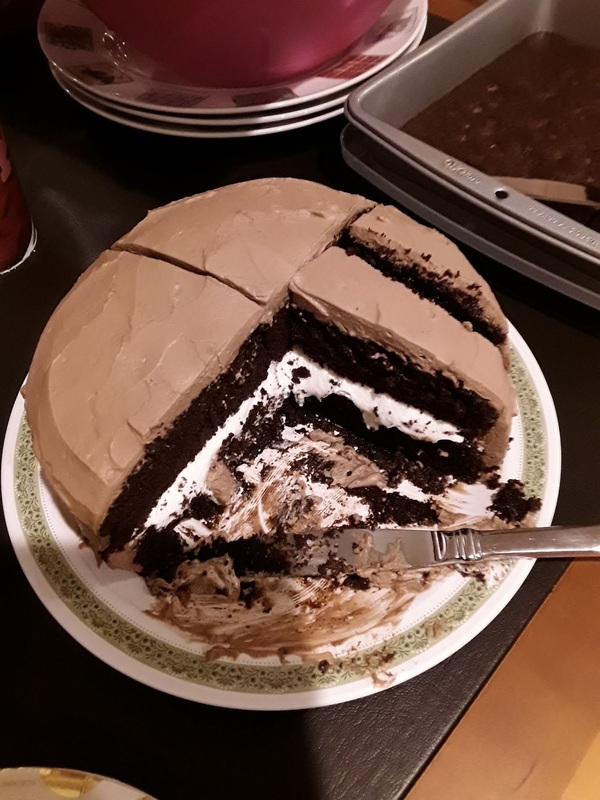 Now that I did taste, and it was heavenly! The recipe is below, I hope you enjoy it! I don't know why the picture is sideways on the recipe card, but I'm trying something new and it has me baffled! If you click the button at the bottom that says View on Key Ingredient, the directions are organized and not all jumbled together. I like the print feature on Key Ingredient, and I think I will be putting my recipes on there from now on. I just have to get used to it! I am linking up to Weekend Potluck over at The Country Cook. 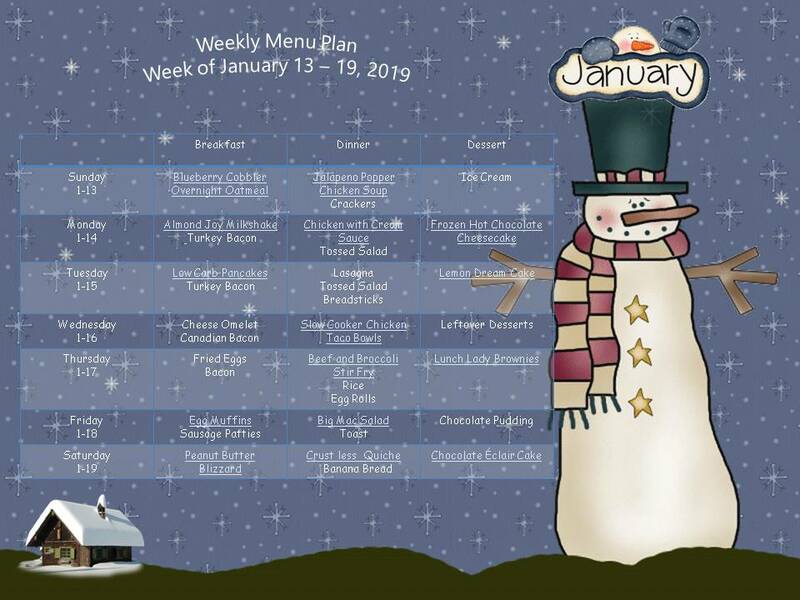 Check it out - lots of fabulous recipes are waiting for you there! I am also linking up to A Morning Cup of Joe Linky Party at The Cottage Market. Hop on over there too, for some really great recipes and crafts! 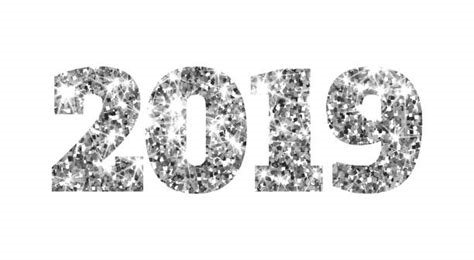 Have a wonderful first day of 2019!